I'm a big fan of Dean Wesley Smith's excellent series, Killing The Sacred Cows of Publishing, in which he sets out certain widely held beliefs that many people, especially writers, have but that happen to be false. One of myths that I've heard over and over again is that only writers who are already traditionally published can make money self-publishing. Another is that if an author self-publishes then no traditional publisher would even think of publishing them. Well, here is one instance where both are shown to be false. A struggling writer landed a book deal with a major publisher after putting her novel online for 96p a copy and promoting it by using social networking. 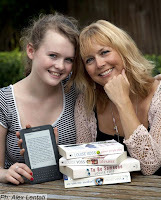 Louise Voss, 42, shot to the top of the Kindle charts after publishing the book in digital form herself after being rejected by literary agents. It attracted the attention of publishers HarperFiction, which offered her a six-figure, four-book deal. As a result, her ebook Catch Your Death will also be printed and stocked in bookshops in the traditional way.